Pre-heat the oven to 250 degrees Celsius. Put the aubergine and red bell peppers on a baking tray with a sheet. Bake the vegetables for about 30 minutes, until they are starting to blister and turn black. Take the vegetables out of the oven and place them in a bowl. Cover with plastic wrap and leave it for 15 minutes. Then take them out and remove the stems. Remove the seeds from the peppers. Be careful, it’s hot! Place the grilled vegetables in a blender or food processor with all the other ingredients. Mix until smooth. Fry or grill the Beefless Burgers as described on the packaging. 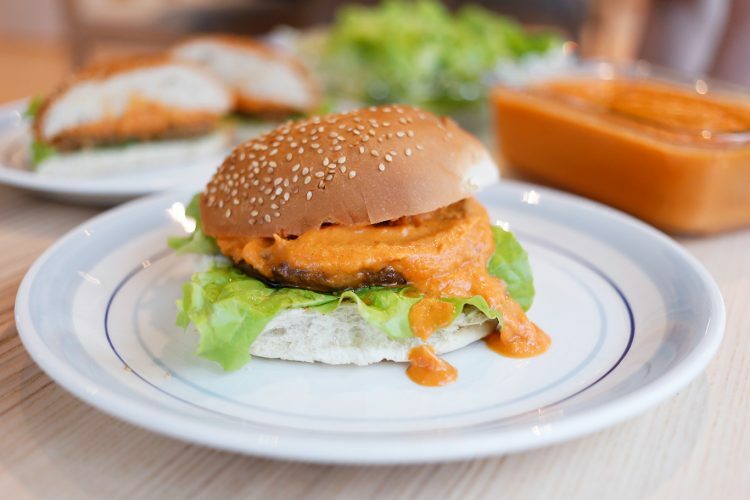 Place salad on a burger bun, then the Beefless burger and ajvar. Enjoy!